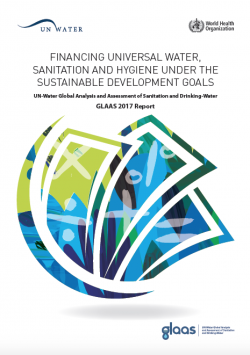 UN-Water GLAAS 2017: Financing universal water, sanitation and hygiene under the Sustainable Development Goals - THE GLOBAL ANALYSIS AND ASSESSMENT OF SANITATION AND DRINKING-WATER (GLAAS)12.04.2017The GLAAS 2017 report presents an analysis of the most reliable and up-to-date data from 75 countries and 25 external support agencies on issues related to financing universal access to water and sanitation under the SDGs. Safe drinking-water and sanitation are crucial to human welfare, by supporting health and livelihoods and helping to create healthy environments. Drinking unsafe water impairs human health through illnesses such as diarrhea, and untreated sewage can contaminate drinking-water supplies and the environment, creating a heavy burden on communities. Benefits of action and costs of inaction: Drought mitigation and preparedness ？ a literature review This review of available literature on the benefits of action and costs of inaction of drought mitigation and preparedness shows that significant progress has been made over the past decade in improving understanding of droughts and their impacts. However, significant gaps in research, policy and practice remain. This paper reviews several methodologies for making economic drought impact assessments and describes the main obstacles and opportunities facing the transition from crisis management to risk management. It identifies drivers of ex ante and ex post action against drought and highlights actions that are associated with co-benefits beyond drought risk management. The findings underline the need for mutually compatible methodologies as a means of comprehensively assessing drought costs and impacts. New Decade for Water 03.03.2017 - In December 2016, the United Nations General Assembly unanimously adopted the resolution “International Decade (2018？2028) for Action ？ Water for Sustainable Development” to help put a greater focus on water during ten years. Emphasizing that water is critical for sustainable development and the eradication of poverty and hunger, UN Member States expressed deep concern over the lack of access to safe drinking water, sanitation and hygiene and over water related disasters, scarcity and pollution being excarcebated by urbanization, population growth, desertification, drought and climate change. The new Decade will focus on on the sustainable development and integrated management of water resources for the achievement of social, economic and environmental objectives and on the implementation and promotion of related programmes and projects, as well as on the furtherance of cooperation and partnership at all levels in order to help to achieve internationally agreed water-related goals and targets, including those contained in the 2030 Agenda for Sustainable Development. In the resolution, UN Member States invited the Secretary-General, with the support of UN-Water, to take appropriate steps, within existing resources, to plan and organize the activities of the Decade at the global, regional and country levels. 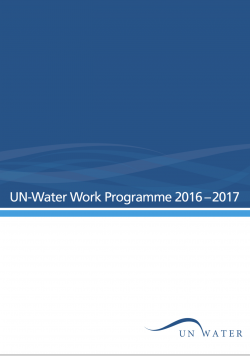 To set the agenda in motion, UN-Water, in its 26th meeting in Geneva in February 2017, decided on the establishment of a Task Force to facilitate its support to the planning and organisation. The Decade will commence on World Water Day 22 March 2018, and terminate on World Water Day, 22 March 2028. 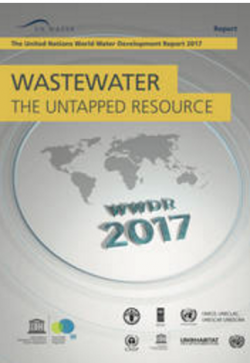 World Water Development Report 2017 World Water Development Report 2017Wastewater: An untapped resource22.03.2017 - World Water Development ReportWhat if we were to consider the vast quantities of domestic, agricultural and industrial wastewater discharged into the environment everyday as a valuable resource rather than costly problem? This is the paradigm shift advocated in the United Nations World Water Development Report, Wastewater: the Untapped Resource, launched 22 March 2017 on on the occasion of World Water Day. 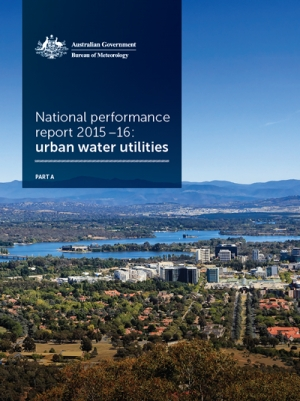 A large proportion of wastewater is still released into the environment without being either collected or treated. This is particularly true in low-income countries, which on average only treat 8 % of domestic and industrial wastewater, compared to 70% in high-income countries. As a result, in many regions of the world, water contaminated by bacteria, nitrates, phosphates and solvents is discharged into rivers and lakes ending up in the oceans, with negative consequences for the environment and public health. 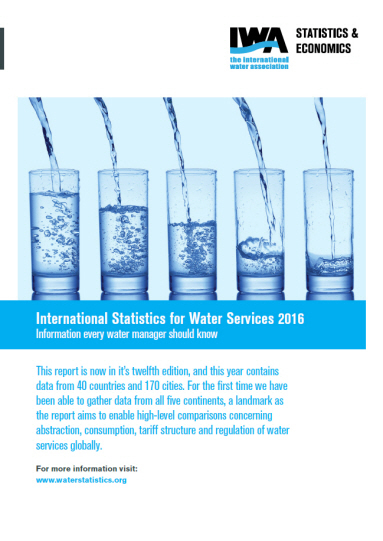 The volume of wastewater to be treated will rise considerably in the near future especially in cities in developing countries with rapidly growing populations. “Wastewater generation is one of the biggest challenges associated with the growth of informal settlements (slums) in the developing world. Reclamation Releases Progress Report on Meeting Climate Change Adaptation Strategy Strategy supports increasing water management flexibility, enhancing climate adaptation strategy planning, improving infrastructure resiliency and expanding information sharingMedia Contact: Peter Soeth, 303-445-3615For Release: November 29, 2016WASHINGTON - Bureau of Reclamation Commissioner Estevan L？pez released a report today that provides a status update on the actions Reclamation is undertaking to meet the challenges of climate change on Western water supplies. This includes meeting the four goals established in the strategy, increasing water management flexibility, enhancing climate adaptation planning, improving infrastructure resiliency, and expanding information sharing. "Climate change poses clear risks to our ability to deliver water and power," Commissioner L？pez said. 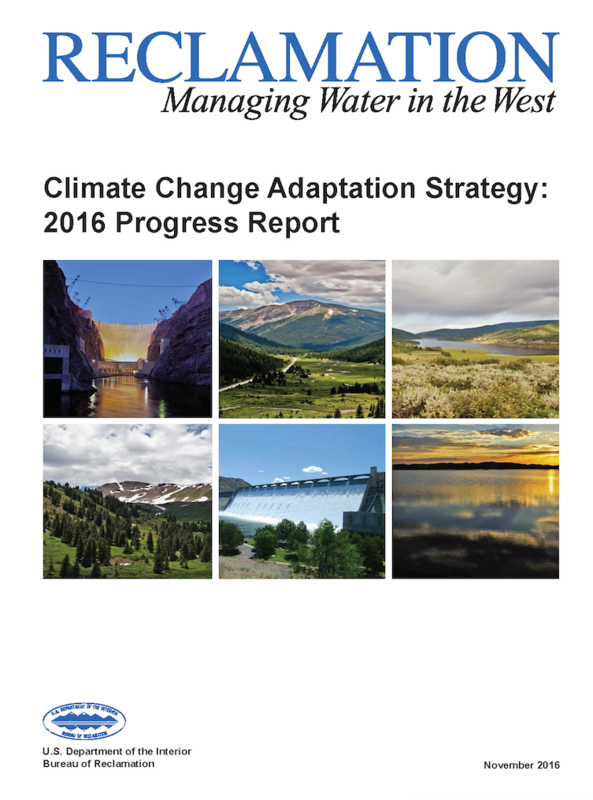 "In light of those risks, Reclamation and our partners will take key steps that line up with the goals of this strategy, helping to ensure a sustainable water supply across the West." The strategy identifies four primary goals to improve Reclamation's ability to consider climate change information in its decision making: Goal 1 - Increase Water Management FlexibilityGoal 2 - Enhance Climate Adaptation PlanningGoal 3 - Improve Infrastructure ResiliencyGoal 4 - Expand Information SharingReclamation is making progress on the activities identified in the four goals of the strategy. These activities include: five reservoir operation pilot studies that are evaluating how weather, hydrology and climate change information can better inform reservoir operations;implementing hydropower optimizations that could increase generation by 410,000 to 1.2 million megawatt hours per year, enough electricity for between 37,000 to 109,000 households;Reclamation is supporting integration of climate change information across planning activities through approaches developed through the basin studies and the drought response program;the Western Watershed Enhancement Program that has provided nearly $1.2 million to cost-share seven wildfire resiliency projects in Arizona, California, Colorado, Idaho and Washington; andReclamation working with its partners to offer climate change training courses for technical water resource professionals and for general audience on integrating climate change considerations into water resources planning.The actions identified in the Climate Change Adaptation Strategy are part of the Department of the Interior's implementation of President Obama's Climate Action Plan, the strategy provides a framework in which Reclamation managers can develop and adopt innovative solutions that provide a more reliable water supply in a changing climate. It also supports the Nov. 1, 2013, Executive Order, Preparing the United States for the Impacts of Climate Change. To view the progress report and learn more about how Reclamation is incorporating climate change into its efforts, please visit https://www.usbr.gov/climate. # # #Reclamation is the largest wholesale water supplier and the second largest producer of hydroelectric power in the United States, with operations and facilities in the 17 Western States. Its facilities also provide substantial flood control, recreation, and fish and wildlife benefits. Visit our website at www.usbr.gov and follow us on Twitter @USBR. Using Data to Build a Sustainable Water Future Summary: Today, we’re announcing a Water Data Challenge to help address California’s water issues through information technology.One of our nation’s biggest challenges is ensuring that all Americans have access to clean and safe water. Our water resources are critical for supporting healthy communities, maintaining our nation’s agriculture, sustaining fish populations, generating power, and providing outdoor recreation opportunities for all Americans to enjoy. However, as we increasingly experience the impacts of climate change―including serious drought conditions in the West that scientists predict will only become more frequent and prolonged―we must revisit how we manage our nation’s water resources, and find new and innovative ways to build a sustainable water future. Nowhere is this truer than in California, where a five-year drought has forced new strategies and increased cooperation to manage the effects of low rivers, depleted reservoirs, and water shortages. For example, residents across the state collectively achieved an average 25% reduction in water use in response to water shortages, and some landowners voluntarily agreed to leave water in streams to benefit the environment. California’s experience serves as a reminder that unless we take action to increase efficiency, reduce water use, and maintain water supplies, the future of our nation’s water, and therefore the future of our environment and economy, is at risk. Now, we need to scale up these efforts, ensuring that the nation as a whole is similarly prepared. As we consider these threats to our water resources, one of the best opportunities we have to strengthen drought-related decision-making and to inform the American public about the significant challenges posed by drought is to make better use of existing information and data. That’s why, today, the White House Council on Environmental Quality, in partnership with the State of California, is announcing a Water Data Challenge to respond to this need. The goal of the Water Data Challenge is for teams to design and develop functional apps or visualization tools that leverage and reimagine existing data sets in an effort to make information more accessible and usable for the public and decision-makers. The State’s website for the Challenge lays out a number of specific challenges, which can be used by participants as general guidance to shape their data-related work. All entries must be submitted by December 5, 2016, and the Challenge will end with a demonstration from the best submissions on December 8, 2016.The Obama Administration has prioritized response to, and preparedness for, increasing drought events throughout the country. Under President Obama’s leadership, this Administration has taken an all-hands-on-deck approach to respond to the drought, working closely with state and local partners including the State of California and its many water districts. At the national level, the Obama Administration has repeatedly brought government and private sector actors together to solve our nation’s biggest challenges―particularly when it comes to drought and clean water ― and has made considerable progress in making information available to help build stronger and more resilient communities. Building on earlier commitments, over the past year the Administration has: Released a Presidential Memorandum underscoring the importance of responding to drought in a coordinated, efficient manner by the Federal agencies, and laying out steps by which to do so. Expanded monitoring and forecasting capabilities by releasing a National Water Model that enhances forecasting capabilities to simulate how water moves throughout the nation’s rivers and streams for 2.7 million locations around the country (up from 4,000 locations to enable a 700-fold increase in forecast density). 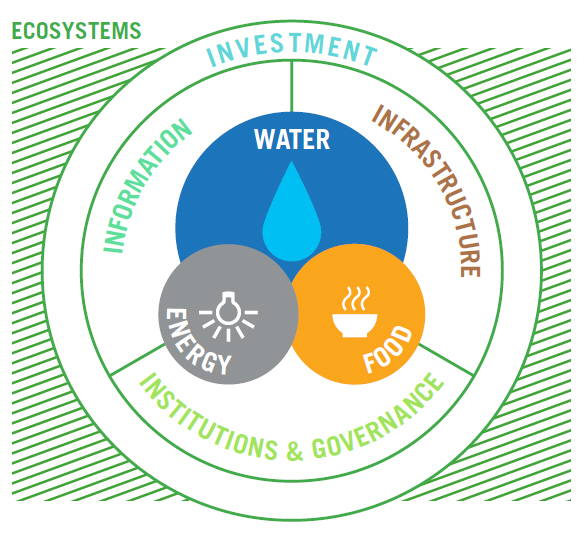 Developed a water innovation strategy to increase the resilience of our nation’s water supplies to these stresses, with the goals of boosting water sustainability through the greater utilization of water-efficient and water-reuse technologies, and by promoting and investing in breakthrough R&D that reduces the price and energy costs of new water supply technology. 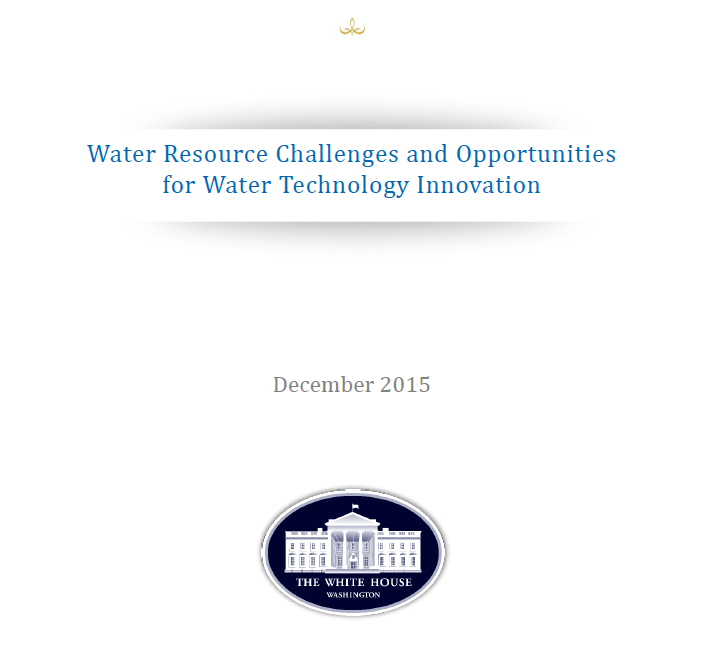 The President's FY17 Budget Request provided $94 million more than in FY16 for water innovation. Promoted water and energy efficiency by announcing a new funding opportunity for over $20 million in water and energy efficiency grants through the WaterSMART Water and Energy Efficiency Grant Program at the Department of the Interior. Funding will be awarded for projects that conserve and use water more efficiently, increase the use of renewable energy, improve energy efficiency, benefit endangered and threatened species, facilitate water markets, carry out activities to address climate-related impacts on water, or prevent any water-related crisis or conflict.The Obama Administration is committed to ensuring that the American public has easy access to the best information. 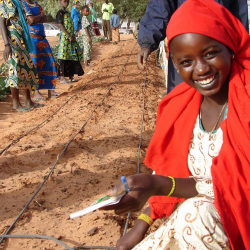 Data and new digital tools can transform the effectiveness of government and its partners, helping to empower communities, spark economic growth, and expand opportunity. Since 2009, the Administration has worked to ensure that a range of data sets on topics of interest and importance are available and accessible to the public, and to create new avenues for civic engagement. Similar to examples like the Federal Opportunity Project, which works to make government data more accessible and to facilitate collaboration at all levels, the Water Data Challenge will bring together developers, coders, companies and universities whose creative capacity can help maximize the impact of existing Federal and state datasets to produce data tools transform how information is accessed and used to move towards a more effective water management system. Ultimately, this Challenge will serve as an example of what is possible across the nation―ensuring that all communities, from west coast to east, are able to effectively and efficiently access the information they need to ensure that a sustainable supply of water continues for all. For more information on the Water Data Challenge criteria, list of relevant data, and guidelines, visit the State of California’s launch page for this challenge at http://waterchallenge.data.ca.gov/.